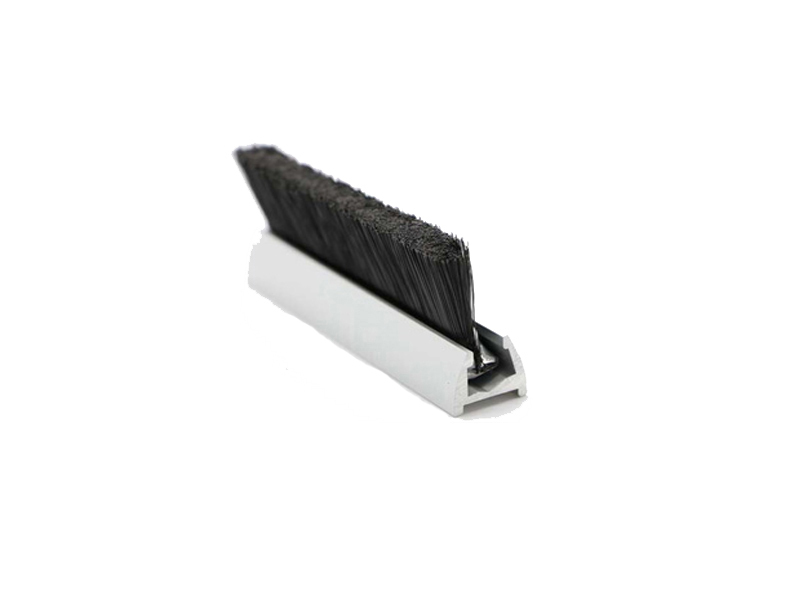 Escalator brush is also name as: skirtde flector fixed on the escalator handrail wall. To class clearance above the dust removal, anti-clip brush combination strip. On August 1, 2012, the new national standard “Safety Code for the Manufacture and Installation of escalators and walkways” (GB16899-2011) was compulsorily implement. The new national standard has clear requirements for the anti-clamping and anti-climbing devices that need to be installed between escalators and apron boards. The escalator brush design and process according to the requirements of the national standard. New GB requirements: apron anti-clamping device should compose of rigid and flexible components (e.g. brush, rubber profile). In practice, the performance of hard brush is better than that of rubber. It is estimated that the hard brush is made of aluminum alloy base and brush. The original anti-clip device is made of aluminum alloy with single or double row of iron brushes. In the actual installation and use, the inconvenience and corrosion resistance of the installation are gradually reflect. Major elevator manufacturers have adopted new aluminum alloy base with plastic strip brush to replace the original iron strip brush as an escalator anti-clip device. The new type of aluminum alloy base + plastic strip brush has the following advantages. The major elevator manufacturers and users are accept it. (1) easy installation. Because the soft plastic strip brush in the middle is easy to bend the arc section of all kinds of elevators, it can be easily inserted into the installed aluminum base. There is no defect that the iron strip brush can bent and easily deform, which makes it impossible to install into the aluminum alloy base and greatly improves the installation efficiency. (2) rust prevention and corrosion resistance. The biggest defect of the former iron brush is that install outdoors, once the water vapor will appear rust, hair phenomenon. If use stainless steel , the cost of the device will increase substantially. So the new plastic bar brush solves this problem easily. The device life can increase greatly. (3) replacement is convenient. As a fragile part of escalator, the brush on the anti-clip device of escalator is easy to wear because of frequent friction. Therefore, replacing the brush bar in the middle of the aluminum alloy base will become routine work for elevator maintenance. Because of the convenience of loading and unloading, the plastic brush has also saved a lot of trouble in maintenance. The base is a good aluminium alloy unit structure, and the anodized surface. The oxide film is above 12 micrometers, and the hardness (HW) > 8 degree. (4) flame retardant properties. The wool is made of functional nylon with high flexibility, strong resilience, strong elasticity and abrasion resistance. Through SVHC testing, the wool meets the ROSH standard, and has flame retardant (fire is extinguished, no burning substance drops off). The nylon density is 1.14, the melting point is 218-224 C, the hot deformation temperature is 185-190 C. When ignited, the flame burns slowly, emits white smoke, the inner layer of the flame is blue, and the outer layer is yellow.